Welcome to hustle culture. It is obsessed with striving, relentlessly positive, devoid of humor and, once you notice it, impossible to escape. Never once at the start of my workweek — not in my morning coffee shop line, not in my crowded subway commute, not as I begin my bottomless inbox slog — have I paused, looked to the heavens and whispered: #ThankGodIt’sMonday. Apparently, that makes me a traitor to my generation. I learned this during a series of recent visits to WeWork locations in New York, where the throw pillows implore busy tenants to “Do what you love.” Neon signs demand they “Hustle harder,” and murals spread the gospel of TGIM. Even the cucumbers in WeWork’s water coolers have an agenda. “Don’t stop when you’re tired,” someone recently carved into the floating vegetables’ flesh. “Stop when you are done.” Kool-Aid drinking metaphors are rarely this literal. Welcome to hustle culture. It is obsessed with striving, relentlessly positive, devoid of humor and, once you notice it, impossible to escape. “Rise and Grind” is both the theme of a Nike ad campaign and the title of a book by a “Shark Tank” shark. New media upstarts like the Hustle, which produces a popular business newsletter and conference series, and One37pm, a content company created by the patron saint of hustling, Gary Vaynerchuk, glorify ambition not as a means to an end but as a lifestyle. “The current state of entrepreneurship is bigger than career,” the One37pm “About Us” page states. “It’s ambition, grit and hustle. It’s a live performance that lights up your creativity … a sweat session that sends your endorphins coursing … a visionary who expands your way of thinking.” From this point of view, not only does one never stop hustling — one never exits a kind of work rapture, in which the chief purpose of exercising or attending a concert is to get inspiration that leads back to the desk. “Owning one’s moment” is a clever way to rebrand “surviving the rat race.” In the new work culture, enduring or even merely liking one’s job is not enough. Workers should love what they do and then promote that love on social media, thus fusing their identities to that of their employers. Why else would LinkedIn build its own version of Snapchat Stories? This is toil glamour, and it is going mainstream. Most visibly, WeWork, which investors recently valued at $47 billion, is on its way to becoming the Starbucks of office culture. It has exported its brand of performative workaholism to 27 countries, with 400,000 tenants, including workers from 30 percent of the Global Fortune 500. In January, WeWork’s founder, Adam Neumann, announced that his startup was rebranding itself as The We Co., to reflect an expansion into residential real estate and education. Describing the shift, Fast Company wrote, “Rather than just renting desks, the company aims to encompass all aspects of people’s lives, in both physical and digital worlds.” The ideal client, one imagines, is someone so enamored of the WeWork office aesthetic — whip-cracking cucumbers and all — that she sleeps in a WeLive apartment, works out at a Rise by We gym and sends her children to a WeGrow school. From this vantage, “Office Space,” the Gen-X slacker paean that came out 20 years ago next month, feels like science fiction from a distant realm. It’s almost impossible to imagine a startup worker bee of today confessing, as protagonist Peter Gibbons does: “It’s not that I’m lazy. It’s that I just don’t care.” Workplace indifference just doesn’t have a socially acceptable hashtag. It’s not difficult to view hustle culture as a swindle. After all, persuading a generation of workers to beaver away is convenient for those at the top. “The vast majority of people beating the drums of hustle-mania are not the people doing the actual work,” said David Heinemeier Hansson, the co-founder of Basecamp, a software company. “They’re the managers, financiers and owners.” We spoke in October, as he was promoting his new book, “It Doesn’t Have to Be Crazy at Work,” about creating healthy company cultures. Heinemeier Hansson said that despite data showing long hours improve neither productivity nor creativity, myths about overwork persist because they justify the extreme wealth created for a small group of elite techies. “It’s grim and exploitative,” he said. Musk, who has more than 24 million Twitter followers, further noted that if you love what you do, “it (mostly) doesn’t feel like work.” Even he had to soften the lie of TGIM with a parenthetical. Arguably, the technology industry started this culture of work zeal sometime around the turn of the millennium, when the likes of Google started to feed, massage and even play doctor to its employees. The perks were meant to help companies attract the best talent — and keep employees at their desks longer. It seemed enviable enough: Who wouldn’t want an employer that took care of your dirty laundry? 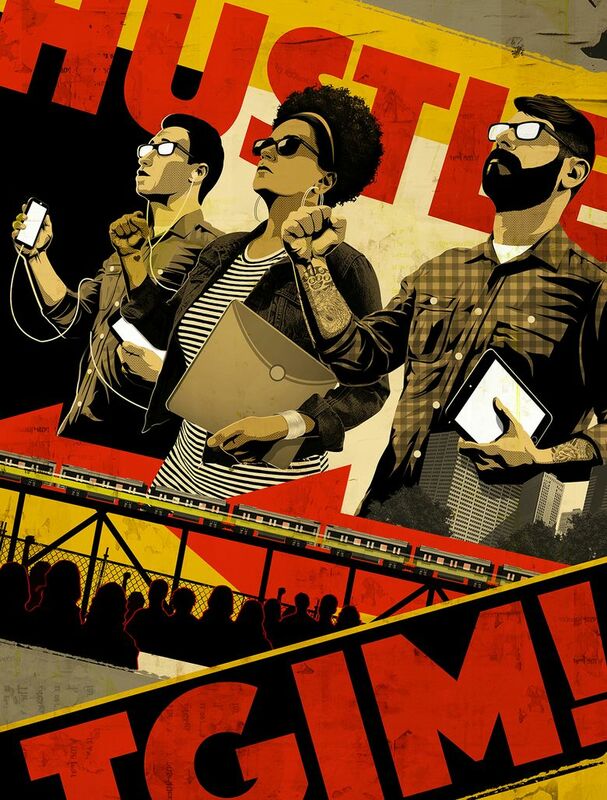 But today, as tech culture infiltrates every corner of the business world, its hymns to the virtues of relentless work remind me of nothing so much as Soviet-era propaganda, which promoted impossible-seeming feats of worker productivity to motivate the labor force. One obvious difference is that those Stakhanovite posters had an anti-capitalist bent, criticizing the fat cats profiting from free enterprise. Today’s messages glorify personal profit, even if bosses and investors — not workers — are the ones capturing most of the gains. Wage growth has been essentially stagnant for years. Perhaps we’ve all gotten a little hungry for meaning. Participation in organized religion is falling, especially among U.S. millennials. In San Francisco, where I live, I’ve noticed that the concept of productivity has taken on an almost spiritual dimension. Techies here have internalized the idea — rooted in the Protestant work ethic — that work is not something you do to get what you want; the work itself is all. Therefore any life hack or company perk that optimizes their day, allowing them to fit in even more work, is not just desirable but inherently good. For congregants of the Cathedral of Perpetual Hustle, spending time on anything that’s nonwork related has become a reason to feel guilty. Jonathan Crawford, a San Francisco-based entrepreneur, told me that he sacrificed his relationships and gained more than 40 pounds while working on Storenvy, his e-commerce startup. If he socialized, it was at a networking event. If he read, it was a business book. He rarely did anything that didn’t have a “direct ROI,” or return on investment, for his company. Crawford changed his lifestyle after he realized it made him miserable. Now, as an entrepreneur-in-residence at 500 Startups, an investment firm, he tells fellow founders to seek out nonwork-related activities like reading fiction, watching movies or playing games. Somehow this comes off as radical advice. “It’s oddly eye-opening to them because they didn’t realize they saw themselves as a resource to be expended,” Crawford said. Millennials, Petersen argues, are just desperately striving to meet their own high expectations. An entire generation of students was raised to expect that good grades and extracurricular overachievement would reward them with fulfilling jobs that feed their passions. Instead, they wound up with precarious, meaningless work and a mountain of student loan debt. And so posing as a rise-and-grinder, lusty for Monday mornings, starts to make sense as a defense mechanism. David Spencer, a professor of economics at Leeds University Business School, says that such posturing by companies, economists and politicians dates at least to the rise of mercantilism in 16th-century Europe. “There has been an ongoing struggle by employers to venerate work in ways that distract from its unappealing features,” he said. But such propaganda can backfire. In 17th-century England, work was lauded as a cure for vice, Spencer said, but the unrewarding truth just drove workers to drink more. Ultimately, workers must decide if they admire or reject this level of devotion. Mayer’s comments were widely panned on social media when the interview ran, but since then, Quora users have eagerly shared their own strategies for mimicking her schedule. Likewise, Musk’s “pain level” tweets drew plenty of critical takes, but they also garnered just as many accolades and requests for jobs. The grim reality of 2019 is that begging a billionaire for employment via Twitter is not considered embarrassing but a perfectly plausible way to get ahead. On some level, you have to respect the hustlers who see a dismal system and understand that success in it requires total, shameless buy-in. If we’re doomed to toil away until we die, we may as well pretend to like it. Even on Mondays.